Community members rallied Sunday in a major show of support for the Jewish Community Center, one week after 19 swastikas were spray-painted on the building’s windows and outer walls. See photos. 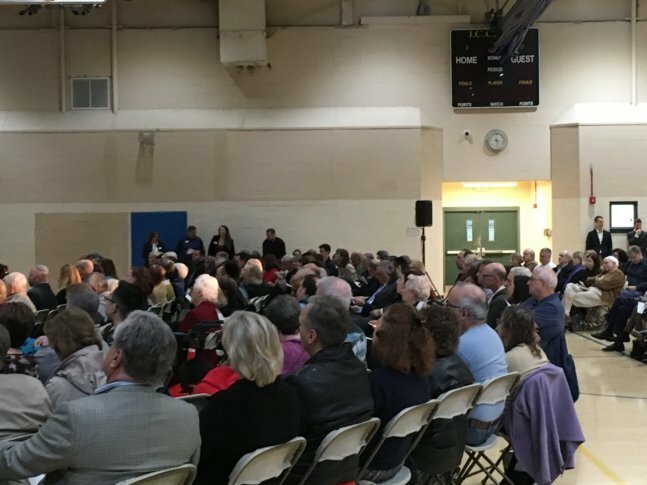 WASHINGTON — Community members filled the gym at Northern Virginia’s Jewish Community Center Sunday evening to continue a show of support over a week after 19 swastikas were spray-painted on the building’s windows and outer walls. The symbols were sprayed on the building during the early hours of Saturday, Oct. 6. A couple of days later, community members gathered to chalk messages of love on the center’s sidewalks. Sunday night, there was another gathering to reinforce calls for peace and a united stand against hate. “We heard over and over again from people — what can we do to help? How can we help you? We want to show up and do something,” said Sarah Berry, Cultural Arts Director at the Jewish Community Center of Northern Virginia. “We had the idea of having people trace their hand prints to both show that they were here in solidarity and to represent the community as a whole,” said Sarah Berry, Cultural Arts Director of the JCC. People gathered at tables to draw outlines of their hands on paper, with various designs from sparkly to pastel swirls, to roses and foliage and more. “These hands represent all of us, and the tree represents life, growth, stability and the ability to weather storms, so it’s great symbolism for this event and for Northern Virginia.” Berry said they’ll start arranging the decorative hands on the tree this week.